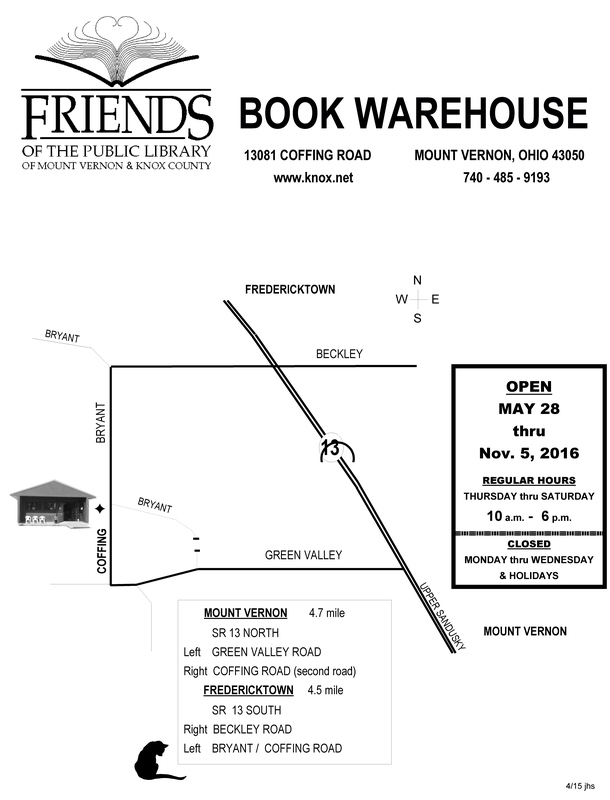 Visit the Friends of the Library Book Warehouse at 13081 Coffing Road, Mount Vernon, Ohio. The warehouse is open May through mid-November, Thursday-Saturday, 10:00 AM to 6:00 PM (except holidays). Cash or check only. Sorry, no debit or credit cards can be accepted. Volunteers are needed to help staff the warehouse and need not be a member of the Friends of the Library. Book donations are welcome and are to be delivered to the book warehouse. Due to liability the library staff are unable to pick up donated books from homes and businesses.